Since the 2016 election of President Rodrigo Duterte, Rappler has fallen victim to a deliberate and highly targeted online campaign by supporters of the controversial head of state that seeks to discredit the media organisation and drown out criticism. In parallel, Ms Ressa has been the target of an increasingly hostile, gender-targeted hate campaign designed to undermine her credibility and the legitimacy of Rappler’s reporting. Rather than retreating from the threats, she has become a vocal spokeswoman in denouncing online harassment and in warning of the negative effects for democracy of the increasing use of technology generally - and social media more specifically - to discredit professional journalism. 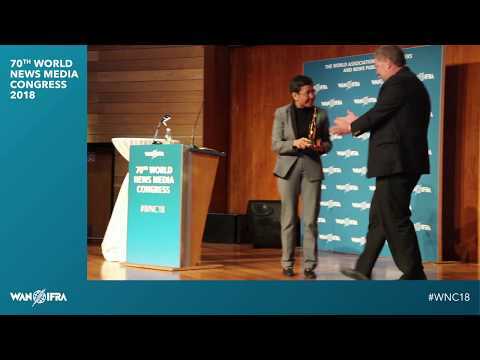 Maria Ressa has been a journalist in Asia for over 30 years, with a career spanning various media. As the bureau chief for CNN in Manila and Jakarta for nearly two decades she was a senior investigative reporter on terrorism in Southeast Asia. In 2005, Ms Ressa headed up the News and Current Affairs division of Philippine media company ABS-CBN, where for six years she worked to redefine journalism by combining traditional and innovative media models. Her interest and talents in technology and new media were an impetus for her becoming one of the founders and eventually the CEO of Rappler, a social news network that aims to inspire community engagement and fuel social change. It became one of the first websites in the Philippines to use online multimedia such as video, text, audio and photos, incorporating social media sites for distribution. In the video interview linked below, Callaway comments on the award.